Go behind the scenes of Warner Bros. Studios and see dozens of celebrity homes on this 4- to 5-hour tour that takes you from Hollywood to Beverly Hills. Warner Bros. Studio Tour Hollywood brings you closer than ever to the entertainment you know and love. Get ready to touch, tour and explore the iconic 110-acre backlot that brought Batman, Friends and The Big Bang Theory to life. Then cruise the palm-lined streets of upscale suburbs like Bel-Air to see houses belonging to A-listers such as Halle Berry and Tom Cruise. This tour is limited to just 13 people, ensuring you enjoy a small-group experience with a guide. Knowledgeable tour guides will take you behind-the-lens for a revealing look at how and where TV and Movie magic is made at Warner Bros Hollywood Studios. Each Studio Tour includes exclusive access to original props, costumes, picture cars, and sets used from Batman to Friends. As part of the Studio Tour, guests will visit The Archive, featuring DC Universe: The Exhibit with authentic costumes and props from the blockbuster hit, Wonder Woman. On the upper level of The Archive guests can see The Harry Potter and Fantastic Beasts exhibit and explore how J.K. Rowling’s Wizarding World has been brought to life on the silver screen over the past 15 years. The grand finale of the Studio Tour is a visit to Stage 48: Script to Screen, an interactive sound stage where you can learn about the production process of a film or TV show, step into an actual set of Friends and take a screen test on the Central Perk couch, become Hobbit-sized at our forced perspective special effect table, soar above Hogwarts on a broomstick and so much more. After the Warner Bros. Studio Tour Hollywood, the second part of your Hollywood experience the 2-hour celebrity homes tour — takes place, chauffeuring you around the exclusive Los Angeles suburbs where movie stars live, shop and go out. 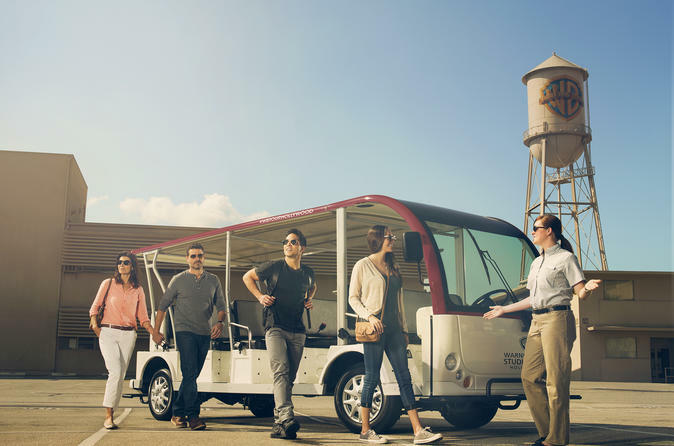 Your small-group minibus allows you to visit neighborhoods that are off-limits to larger coaches so you can see as many unbelievable mansions as possible. See houses that belong or used to belong to stars like Halle Berry, Tom Cruise, Madonna, David and Victoria Beckham, Ozzy Osbourne, Richard Gere, Lucille Ball and Frank Sinatra. Cruise down the Sunset Strip, enjoy a view of the Hollywood Sign, and pass by Hollywood hotspots like the Walk of Fame, Whiskey a Go Go, the Viper Room and Chateau Marmont. Stop by Rodeo Drive to see the designer stores and sparkling jewelry shops that outfit A-list actresses for awards shows, and zip by the Beverly Wilshire Hotel, featured in Pretty Woman. By the end of your day tour, you’ll be an expert in all things Hollywood and have plenty of stories to take back home to family and friends. *Sets and soundstages subject to change. © 2019 Hello LosAngeles - All Rights Reserved.